Stone steps. This is what you deal with in Nepal. All life revolves around up and down on stone steps. Villagers don’t consider it awesome. I do. Every time I lean over or heave up on my sticks I wonder if I’ll die. There’s nothing easy about these steps, no comfort zone, no smoothing out. A trip or a stumble and it could be ciau baby. From Landruk to Ghandruk doesn’t look far but it takes severely down steps for a thousand feet, crossing a bridge over a raging river, then severely upward steps for two thousand feet to get there. 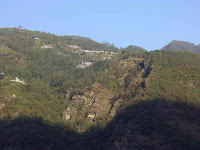 Jim estimated we stepped on more then 6000 steps by the time we reached our Ghandruk. That’s just in a four hour period to cover a mile of steps. Tomorrow it’s six hours of straight down steps as we head toward the nearest road which will take a long tomorrow and a short next day to reach. My glutes, quads and calves are crying out for peace. Hold on fellows, I say. 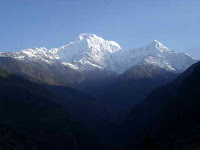 We’ll be in the jungle in a couple of days for a rest before starting the trek from 9000 feet to 17,000 feet which is about the altitude of the base camp of Mt. Everest. So today I am horizontal for the afternoon in another hard bed in a small cubicle with a big window watching a hale storm creep up with little thunder. I’m sneaking in a few Pilates stretches, hoping that’ll help. 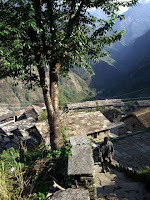 It’s lunchtime (I tried Dhal Bak finally and liked it) and we made good time for me on this mornings trek to Ghandruk. Blessedly we arrived before the storm at Hotel Manisha which claims to be the stopover for the road to Shangrila. Not in the old black and white movie I remember. I can see from here across the way to where we departed from this morning and it makes me feel good that I e ven made it here at all. The Nepalis have consideration for us poor trekkers so every so many feet of steps a resting seat of stones gives us something to lean or sit on to catch our breath. It’s not always in the shade but it helps our lungs restore breathing. And ponder the next inning of your life. For sure, there’s no running down to the corner store for something, although it’s no effort for the Ghrundruks who do it every day, except there’s no corner store to solve your needs. There is no fat on the people here, nothing extra on their bodies. And there’s no butter with bread, no magazines, no ice, no ice cream - although th is hotel has a freezer which was, understand, brought here on the back of a man. If you want tables and beds, someone has to bring it on their back, a strong rope tied around their forehead for support. I follow my guide, Jim. I don’t look around much at the scenery which drops like a water fall because I might get vertigo. I have come to know the heels of his hiking boots, the muscle in his calves (he wears shorts), the clank of his sticks as he moves slowly forward (on my behalf) and also tiny white flowers soon to become wild strawberries, miniature blue forget-me-nots, all kinds of grasses and moss, hard candy wrappers, (no cigarette butts), sweat in my eye and more shiny schist (the name of the stones of the steps)which are often ungracious with animal poop, and some human. Jim warns me just in case. When we finally reach our stop for the night, facilities at lodges sound better than they are. Attached toilets, which trekkers fight for, and often there is only one in the place, means a seat but the water has to be turned on for it to flush. Shower fixtures are on the wall but nothing comes out of them, much less hot water which needs to be brought in a bucket so you can sponge off. Not accustomed to this habit I stuck my hand in the water when the soap dropped and burned it. This lodge, as many do, advertised hot water. It’s solar heated. By the time I got ready to ta ke a showeer, everyone else had taken showers and used up all the heated water. So I have to ask my porter to bring up a bowl of hot water so I can wash my face at least. Yesterday I had to wash underwear, and so combined using my underwear as a washrag when they had been first washed clean.. Then the underwear is hung on the backpack to dry as the trek moves along and if the rain doesn’t come. You have to make do. Most lodges also claim electricity but that’s only meek light and not necessarily plugs and usually the electricity has gone off before you’ve finished your writing or reading. I write my blog at 3 or 4 in the morning, fixing the pictures and preparing it to be sent at 7 a.m. when Jim sets up his satellite equipment. I usually write in the dark, which is a mess since I can’t see the keyboard. Takes a while. Before I left home and when I was in Kathmandu many people asked, "Aren’t you excited about your trek?" Excitement never played a part. It is pure unadulterated challenge. I knew I’d wreck from my history book every idea of normality, every developed muscle, every target to bullseye what’s to come, every moment of loneliness and frustration. I’ve never pretended to be a trekker but to get to do the things I’d hope to do before I die, I have to use my feet to get it done. I think there’s nothing heroic about what I’m doing. Just because I’m 68 and a new sister of cancer really doesn’t apply here. I’m only heroic when I argue with myself to life that leg up one more time and struggle to keep on going.. My father would have said ,"You got yourself into this, so do it." Well, I’m trying. I don’t know what getting to Everest base camp will ent ail (freezing mornings, climbing continually, acclimatization and positive attitude when there are no conveniences) but the Annapurna region of Nepal has been the biggest physical challenge in my life so far and every morning when I cinch on my security blanket ( the Prada fanny pack, the Golden Door water bottle, my Kleenex brought from home, and a package of gorp) I’m giving it an other shot. Through the odors of smoke, fried bread and dung, I hear the birds sing masterpieces from dawn to dusk and in between rain storms, although I cannot see them. We would sing too, I guess, if we could fly through such valleys as these framed with some of the highest snow covered mountains in the world, all to see a view, all to see how another culture lives, all to see how far my body will stretch and my mind, too. If it’s worth the agony and the ecstasy, will I ever know? 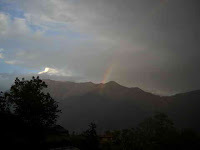 Well, this afternoon in this masterpiece landscape, a rainbow spread its arc across the valley. That’s my God. He’s always giving me gifts of hope. I believe he uses rainbows to assure me I’m doing the right thing. 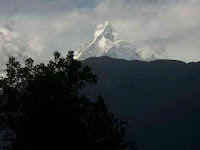 Photos: Annapurna South at dawn; We’re going over there to Ghandruk. The continual steps. A Nepali child. 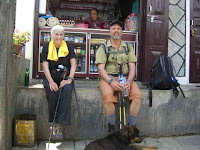 A pair of trekkers taking a rest. Fish tail after the rain. The rainbow.